Amazon is currently running a $20 sale on its most popular Kindle Paperwhite device. It is now on sale for $99.99 (was $119.99) And even better if you’re shopping for Kindle with a fancy leather cover you’re in luck. Kindle Paperwhite Bundle is on sale for $139.97 which is $40 cheaper than its usual price of $179.97. When you choose a cover color (on a Kindle Paperwhite Bundle page) which is not available right now, Amazon shows you a message saying: “Currently unavailable. 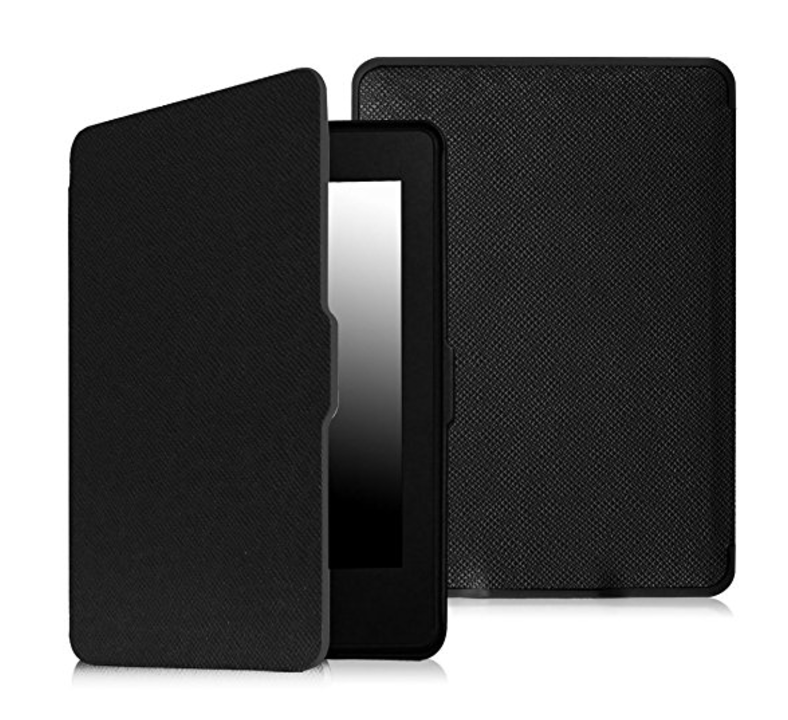 We don’t know when or if this item will be back in stock.” But if you go to Amazon Kindle Paperwhite Leather case, Fuschia (or any leather cover page which is currently unavailable) you will see that product will be in stock on December 24th, 2016. So it may mean that Amazon only running Kindle Paperwhite Bundle deal until December 24th or it may also mean that the deal will continue until New Year and covers in other colors will appear as part of bundle deal on December 24th. But if you are not crazy about specific Kindle colors I would hurry because this deal is quite good and is the same deal Amazon had for Kindle Bundle on Black Friday. Here is what is included in Kindle Paperwhite Bundle deal with Leather Cover and Power Adapter. 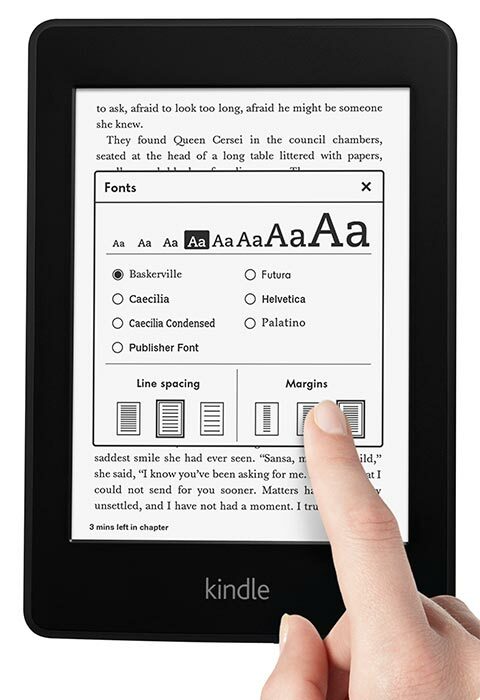 At this time Amazon has expanded their hardware offerings to include three types of Kindle. The Kindle eReader is still going strong, while the Kindle Fire HD and new Kindle Fire HDX justifiably occupy their space atop the Android tablet market. The release of the HDX also beings in a lot of great features that users have been requesting since Amazon’s first foray into tablets. Improvements added to the Kindle Fire HDX over the Kindle Fire HD go beyond the incremental changes that we would take as a matter of course. There is the expected power increase, bumping it up to a 2.2 GHz Quad-Core CPU, as well as slightly improved battery life, but that is only the start of things. The HDX is also lighter, has more cameras (Front-facing added to the 7” model, Front- and Rear-facing now included on the 8.9”), and features a higher resolution screen with greater pixel density than the iPad 3. The biggest benefits aren’t available from hardware specs, though. Fire OS brings a lot to the table. The most-hyped addition is the Mayday button. This will connect you instantly with tech support and allow they to walk you through any problem you might have, giving them access to your screen and the ability to highlight various portions of it to point out important functions. Perhaps most important to device adoption is the expanded enterprise support that Amazon has put in place. A lot of people have been using the Kindle Fire at work and Amazon has taken steps to make it more useful for that purpose. There is now VPN support and MDM available through companies like Citrix. It makes for a much friendlier BYOD offering. The existing Kindle Fire HD remains an excellent tablet in its own right, despite not measuring up on paper to its successor. The fact that the HD remains only $139 (8.9” – $229) compared to the HDX’s $229 (8.9” – $379) helps to assume that it isn’t going to be abandoned right away. Still, if you have the money and the inclination then the HDX is definitely the superior product. The eReader side of Amazon’s Kindle line has been fading away in the last year or two. It doesn’t get much spotlight now that there isn’t much room to grow. Still, they did recently update the Kindle Paperwhite to a new version and find a few ways to make it even better. The improvements in the new Paperwhite are small, but noticeable. It is a bit faster, somewhat more responsive, and contains a better light than the original version. Most importantly they have evened out the lighting a bit around the edges. There are unlikely to be any complaints about the way things look now. While they may not be betting everything on eReaders anymore, Amazon hasn’t left Kindle readers behind. Paperwhite As Christmas Gift? Better Hurry! The Kindle Paperwhite is a big step forward for its whole product line. It provides a way for the user to read a book in a dark room without providing their own external light or straining their eyes. That’s something people have been hoping for out of eReaders since the day they started hitting shelves. It’s probably to be expected that the response has been enthusiastic. Even Amazon appears to be surprised by how enthusiastic people are getting, though. While it’s only the beginning of November, we have already seen Kindle Paperwhite shipping dates slip back twice. First they were pushed back to the beginning of December and now as I’m writing this they are set for the week of December 17th. The most popular reading device on the market experienced such a surge of consumer interest that Amazon, the world’s largest online retailer and producer of the previous millions of Kindles sold, was taken by surprise and left unable to ship promptly. That’s good news for fans of the Kindle and great news for eReaders in general, somewhat putting to rest the recurring speculation that it’s a market on the way out due to competition from tablets. Unfortunately, it also calls into question Amazon’s ability to meet holiday sales demands. While their track record indicates that there’s a good chance many of those orders will ship well before the 17th of December, that date wouldn’t be on display if they could guarantee things sooner. If we’re already pushing orders back until a week before Christmas with seven weeks to go before the holiday, Amazon will have to be producing to exceed current high demand levels. Nobody really believes that demand will drop abruptly before the end of the year at this point. A month is a long time to get production sped up. Maybe it’s premature to be talking about this. The fact that the orders put in today are being set back so far is strange, though. If you’re hoping to make the new Kindle a big stocking stuffer for your family and friends, it might be best to get a jump on shopping. At this point I think the best we can hope for is last minute deliveries and nobody likes gambling on FedEx and UPS being prompt at that time of year. We already know that Amazon intends for the Kindle Paperwhite to set the new standard for eReader hardware in every way they could manage. Some people might still wish for physical page turn buttons (I certainly do) but other than that it is a clear step ahead of all of the competition right now. That’s referring entirely to the US markets, of course, which may be a good reason that they have decided to update the Paperwhite firmware with some specific comic-related improvements in mind. On a November 8th release, the new software improvements were made available for download. If you have a Paperwhite and haven’t gotten everything automatically delivered to your device at this point, check out the side-loading instructions located here. Foremost in the advertised improvements is the list of optimized fonts. Palatino, Baskerville, and Futura have all been made sharper and smoother. It’s a small thing in many ways, but the change will stand out for anybody who prefers to use these fonts regularly. The ability to remove Recommended Content from your Paperwhite’s home screen is now also included. This has become a point of annoyance for many users, but the ability to remove this particular advertising stream was added not long ago to new Kindle Fire models and was inevitable here as well. A more interesting update would have been producing the same stream for older models on demand, honestly. The settings menu has been brought to the front of things a bit more as well. You can now jump straight into this menu directly from the menu while reading a book with no need to return to the home screen. Perhaps most importantly, given the recent push into Japan, is the improved manga/comic display capability. A new Fit-to-Screen option will stretch images to fill the entire screen, addressing many situations where small panels were practically unreadable previously. The Paperwhite is also now able to retain a manga/comic specific setting for page refresh preferences that is completely separate from the same options for book reading. This makes it easier to choose the proper setting to maximize both battery life and reading quality in two areas with distinctly different visual representation needs. In preparation for a move beyond Japan into China, Simplified Chinese is now included as a font option. It’s a small note now, but could be vital in the long run. The only other really notable change is in book samples. When picking up the full version of a given book after reading the sample you will now start off at the last position accessed in the sample. The sample itself will be removed from the library. Organization will be greatly improved as a result for anybody who regularly samples their books. Many of these updates are small things, but added together they make for a great update. There is more than can and likely will be done to improve things, especially with regard to comic-reading. Now that we’re seeing a much bigger effort to get graphic storytelling into the Kindle marketplace, however, it’s safe to assume that a wider audience will demand attention and genre-specific features that will quickly optimize the eReaders as best a black and white display can be optimized. As of November 19th, the Kindle is five years old. Since its first incarnation we have watched it go from a fairly clunky attempt at introducing something new into the market to an elegant piece of technology that continues to deserve its position at the top of the same market it helped popularize. We’ve been watching this progression since the beginning (our first post here was less than a month after launch on December 15th 2007) and it’s been a great time. Looking back at the first generation Kindle is a great way to help understand why it hasn’t been just the hardware keeping the line going. Amazon made a fairly good eReader, but even at the time there were superior options. The first Sony Readers to be released in the US were lighter, faster, and generally more pleasant to use. Still, Amazon pulled off a “good enough” device and supported it with the best digital reading content anywhere. The Gen 1 Kindle had a resolution of 800 x 600, less than a quarter gigabyte of storage space, was uncomfortable to hold for long periods of time (compared to newer models, though it was great at the time), and would run you around $400 without a case or any books included. About the only thing it had going for it compared to future products was the SD card slot, which was eliminated in the second generation. That’s not to say it was a bad device so much as to illustrate how far things have come. When new, the first Kindle captured the attention of huge numbers of people despite the price and was often held up as a valid alternative to the iPad. That comparison is nonsense, but it illustrates how interesting people found the idea. For comparison, you can now get the Kindle Paperwhite (assuming you can find one since they are in short supply at the moment) for $119. It has a 6”, 212PPI display running with a 758 x 1024 resolution. Battery life will last you over a month at a time in many cases. The internal storage us up to two gigabytes and you can download your books on your home WiFi. There is lighting for the screen without any of the problems that E Ink was solving compared to lighted screens in the first place. Five years has meant a lot of progress. Most importantly, the Kindle Store and Amazon’s support for its associated features have expanded even more. The whole publishing industry has been forced to take digital distribution seriously and nobody does it better. Kindles now enjoy a presence in millions of homes around the country and we expect to see even more of them in organizational settings like libraries now that central management tools have been released. What is still to come for the Kindle is open to debate. Some people expect a move away from eReaders to concentrate on the Kindle Fire tablet line. Personally, I doubt it. The Kindle eReader is what put Amazon on the map in terms of computing devices and it will continue to be a major point of interest in the future. The only real question is how much further they can take it and in what direction. Having used the Kindle Keyboard for quite some time and enjoyed it to the point of returning my Kindle Touch when it didn’t quite meet the same standards (it was fine and had its own perks, but wasn’t as strong in some of the areas I cared about), I didn’t jump on the Paperwhite when it was first available. I’ve played with it enough to know what I’m talking about in various capacities, but only recently have I picked up my own. Aside from one small complaint, it’s exactly what I was hoping it would be. The contrast of the Kindle Keyboard was pretty much ideal for me. It created the experience of reading an old, familiar paperback. The new screen was troubling at first because the contrast was actually too extreme. I would say that it more or less resembles a newer high-gloss trade paperback. Not my favorite presentation, but it was very simple to get used to and quickly became a non-issue. All the other benefits of E Ink displays were naturally still around. The Paperwhite’s signature feature is obviously the front-lighting technology. It was definitely an improvement over the Nook Simpletouch w/ Glowlight. The light was more evenly distributed and brighter without creating a greater drain on battery life. The issues with banding on the bottom of the display are not exaggerated necessarily, but they also have little effect on reading. I found it somewhat annoying to have trouble seeing the progress bar at some points when reading in complete darkness, but the dark areas are still readable and don’t tend to extend into the text in any meaningful way. The overall experience beyond simply the screen is also worth noting. The loss of 1.2 ounces compared to the Kindle Keyboard makes a small difference overall, but I could see it being meaningful over long reading sessions for some people. As a reader used to holding the old model for hours at a time, it didn’t stand out as particularly useful (especially if you’re using a case anyway) but the reduction was still big enough to note. The “Time to Read” meter is better than expected. It comes up with an accurate measure of your reading pace after a few minutes, basically enough time to fall into a measured pattern, and generally gets things right from there. Obviously it can’t account for breaks and distractions, but how could it? If you’re in the market for a new eReader, the Paperwhite is the only real option at the moment. Nothing else comes close to offering the same quality. Is it enough to consider going out of the way to upgrade from a previous model? Under most circumstances I would say yes. The only really obnoxious shortcoming the device has is a lack of physical page turn buttons. In every other way it’s a functional upgrade. For me, the weight of the accumulated features made the Paperwhite an appealing option, but it isn’t at all unreasonable to consider that a make or break factor. If you can, give it a try and find out for yourself. 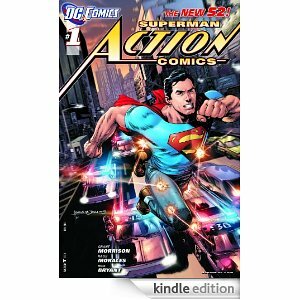 While DC Entertainment is insisting that the move is not necessarily a switch away from Comixology, the publisher has now made the transition to offering its weekly content directly through the Kindle, Nook, and iBooks stores. There is now very little reason to expect anybody to continue using the Comixology apps given that their main selling point was exclusive access to DC content. This change in distribution model comes at a time when digital distribution is up nearly 200% over 2011’s numbers. For comparison, DC has stated that their physical volume sales are up just 12%. Given the already comparatively strong sales of the weekly comics in question it is a lot simpler to increase the audience for digital content by an impressive percentage, but this also comes at a time when many publishers are seeing digital distribution begin to overwhelm their traditional sales market. The plan for rollout is essentially what you would expect. The new titles, especially those that are part of DC’s “New 52” franchise reboot, will be available immediately as they are released. Over an as-yet undetermined period of time they will begin issuing the back catalogue. A DC spokesperson claimed that the only real reason that it would take some time to get to content that wasn’t brand new was the limitation of bandwidth. The more interest digital content generates, the faster they will get the whole library converted and available through the various stores. This should go a long way toward both increasing interest in digital comic distribution and proving that an online distribution model will work for such a large publisher of graphic storytelling. Seventy titles are already present in the Kindle Store and more will be around soon. Perhaps it’s a matter of personal opinion, but I doubt there will be much concern over the end of Comixology’s reign when it comes to comic content being served to Kindle Fire owners. It’s only a matter of time now before everybody else catches on. The move away from physical keyboards gave Amazon an easy route into any number of non-Anglophone markets for the first time. They’ve made good use of that since the Kindle Touch was first released. In addition to being able to find a Kindle practically anywhere in the world, localized versions of the popular eReader can now be found for a number of language options. Now, for the first time, Amazon is pushing their efforts into Asia with the first ever Japanese Kindle. 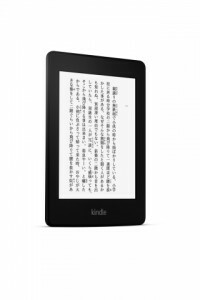 Amazon.co.jp will now have its own Kindle Store and will be offering the Kindle Paperwhite for sale. Preordering is now open for both the WiFi and 3G versions of the device. The prices are currently ￥8,480 and ￥12,980 respectively. They will begin shipping on November 19th. Japan has proven a hard market for Amazon to move the Kindle into so far. Their site has been operating successfully there for twelve years now, but it has been reported that they had trouble getting Japanese publishers interested in doing business with them after all of the conflict between Amazon and the Big 6 publishing houses in US markets. It seems that terms have now been reached that are considered satisfactory. The press release for this announcement indicates that over 50,000 Japanese-language titles will be available at launch and that these will include the largest selection of Oricon best sellers anywhere. Naturally all of these titles will be accessible through Amazon’s various distribution channels. Kindle Paperwhite owners will be able to make use of the new store, but so will Kindle Fire owners, Kindle app users, and anybody with a web browser. Introducing the Kindle line to Japan is a particularly important move for Amazon if they want to keep expanding the customer base. While geographically small, Japan is home to one of the most literate cultures in the world. It also enjoys the widest newspaper circulation anywhere and may prove a useful place to renew interest in digitally distributed newspapers and magazines. There is also a large market for graphic literature to be exploited. This launch will include over 15,000 manga selections. Kindle Format 8’s Panel View will come in handy for this and the high contrast Kindle Paperwhite display could prove an ideal medium for these books. The Kindle Fire and Kindle Fire HD are also now available in Japan and should be shipping on December 19th, one month after the Paperwhite goes out. While this caters to a different market, having options is never a bad idea. The Kindle Fire HD might not be quite as good for reading as its single-purpose eReader counterpart, but it does provide a greater versatility and convenience for the money. One of the questions I’ve been asked frequently lately is what the point of a Kindle eReader could possibly be now that it’s lit up. Obviously this has been addressed before, but maybe it’s worth going over again now that the Kindle Paperwhite finally pulls off a positive reading experience that includes a light. First off, the main attraction of the Paperwhite is that it retains the E Ink display’s advantages while still allowing the user to read in the dark. Unlike the LCD you’re likely to find on a tablet, including the Kindle Fire and Kindle Fire HD, the lighting used in the new eReader is not coming from behind the screen. Instead it is reflected through a layer on top of the print which spreads illumination evenly from the lights on the bottom of the screen. Many people, perhaps even most, find that this causes significantly less eye strain during extended periods of reading because the light is not being directed outward at the eyes. 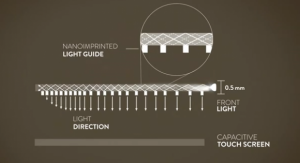 The E Ink screen underlying this lighting layer is not your typical display either. E Ink has been around for a while, but since I still get some questions it is worth explaining. The premise is simple enough. Each pixel on your Kindle’s monochrome screen has two settings. It can be either dark or light. This state is only changed when there is reason to change it. This means that unlike constantly refreshing displays like the monitor you are likely reading this on, the Kindle’s E Ink uses practically no power. It also reflects light much like paper does, which helps provide a pleasant reading experience. There are downsides to just about anything, of course. 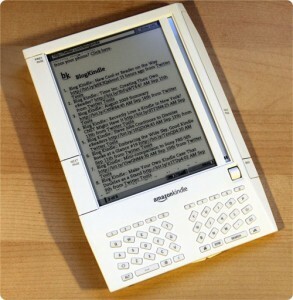 E Ink eReaders in general are known for showing a flicker each time a page is turned. This relates to the same behavior that provides these devices with such amazing battery life. Remember that the screen only refreshed when needed, so it clears the current selection this way before putting up the next page. The flicker has gone from a 1-2 second annoyance in early eReaders to a barely noticeable flicker that takes a fraction of the time turning a physical page would on the Kindle Paperwhite, but it does still exist. Specific to the Kindle Paperwhite and Nook Simple Touch w/ Glowlight is the problem of uneven lighting. While not nearly as obvious as the Nook’s, the Kindle Paperwhite’s lights are visible at the bottom of the display in some situations. This is especially easy to spot when holding the Kindle at extreme angles or when reading with the light turned up particularly high in a poorly lit room. Few people seem to be troubled enough for this to be a major problem, but it is common enough to be worth noting. In certain situations the lighting will not be 100% evenly distributed. Overall, the advantages of the Kindle Paperwhite are basically the same as those the Kindle has enjoyed over tablets all along. It costs less than a tablet, doesn’t use a light source that is hard on the eyes, runs for weeks at a time without charging even when being used regularly, and provides a better overall reading experience. While it isn’t nearly as bad to read on a tablet as it used to be, the Kindle Paperwhite is highly recommended for anybody who reads frequently or for extended periods of time.